A straightforward Church Micro cache located close to the Parish Church of Duloe. Headline coordinates take you a bench dedicated to George Raffle - this is the first stage of this multi cache. 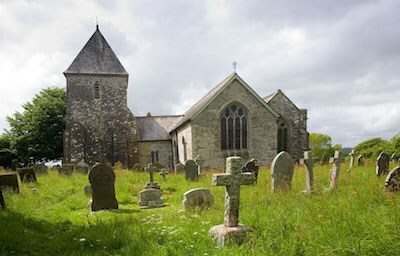 The most interesting features of the Duloe Church, which is dedicated to St Cuby and St Leonard, are the tower and the Colshull Chapel. The base of the tower is massive and dates from the 13th century and is topped by a 19th century pyramidal roof which is said to be an approximation of the original roof. The Colshull Chapel is part of a 15th century extension provided by the wealthy Colshulls of Tremadart. There is an effigy of Sir John Colshull – the second richest man in Cornwall in 1450 – above his tomb chest. The effigy shows him in full armour as befits a knight and a sheriff of Cornwall. There are many highly decorative memorials dating from the 16th, 17th and 18th centuries inside the church which is well worth a careful look around. Graffiti, thought to date from the times of occupation by Parliamentarian soldiers, is clearly visible in the stone of the effigy. It is amazing to see this graffiti which is almost 500 years old. Parking for 1/2 cars is available at the front of the cemetery gates at N 50 23.800 W 004 29.104. Enter the church grounds via the metal gates at the parking coordinates and walk up towards the church. Follow the path clockwise around the church until you come to the bench dedicated to the memory of George Raffle under the east face of the tower at the headline coordinates.